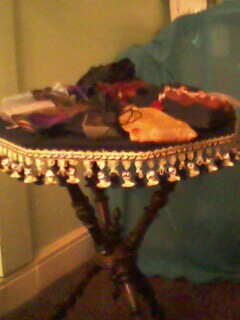 This style of Gypsy table is called the "Gypsies Cat"
Gypsy tables are small three legged tables which are used for fortune telling and games of chance, Many date from the late 18th century, They are always covered in a cloth or material covering when they have been used for fortune telling, card reading or crystal ball scrying. The Hexagonal ones are usually more to do with reading cards, (both The Tarot and the gypsy cards which are more like a playing card deck.) and palmistry. The legs unscrew for storage,as they were stored in the gypsy Vardo, and also carried around by hand to fayres and fetes,they are assembled in seconds, for readings. They can also be taken down quickly when used in areas where no permits were allowed. Some of the table tops are hinged in the centre, for ease of transport these were usually later examples, and are quite rare. The tables vary in shape, both round or octagonal tables are common, however there were also horseshoe shapes and clover shaped tables , though these were usually more used for card or dice and games of chance. The rarest table that was in Sues' collection was unfortunately one which was destroyed in the fire at Easter, 2009. this was octagonal topped, with three wide spaced legs which had a spacer at the base with a circular holder within it to hold a crystal ball. They usually have a velvet cover , as the cards must not be laid on wood, but cloth, by tradition. 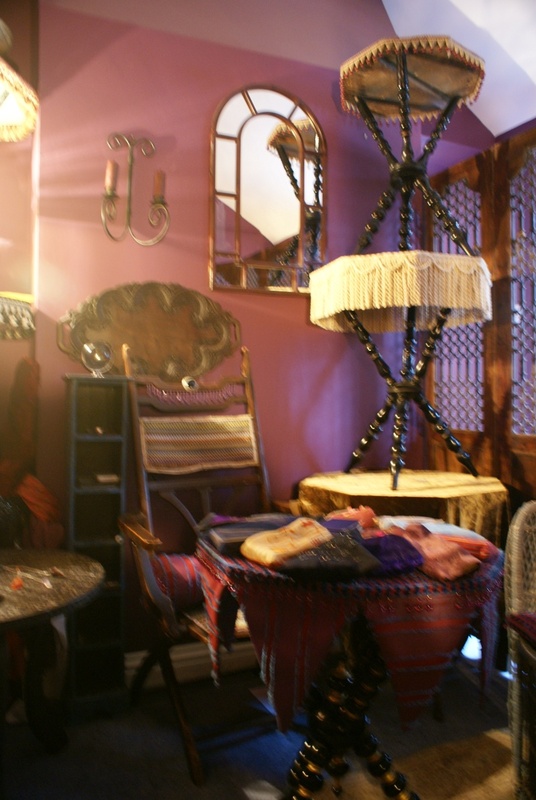 Sue collects Gypsy tables, occasionally she may have one for sale,(to the right home). Most tables were decorated with beads or fringing, some were decorated with embroidery, and there were even higher quality tables which had gold leaf applied on the legs and base. 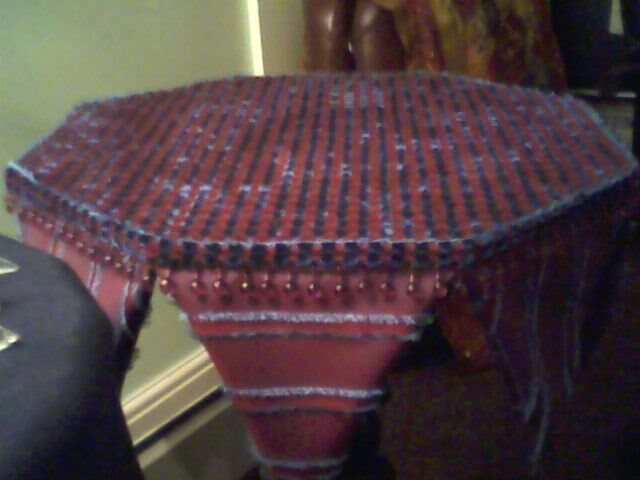 Sue is always interested in gypsy tables of any type, please contact her if you have one you would be prepared to sell. Often they are found without the fabric cov ering for which they are known,or have stained and torn covers. 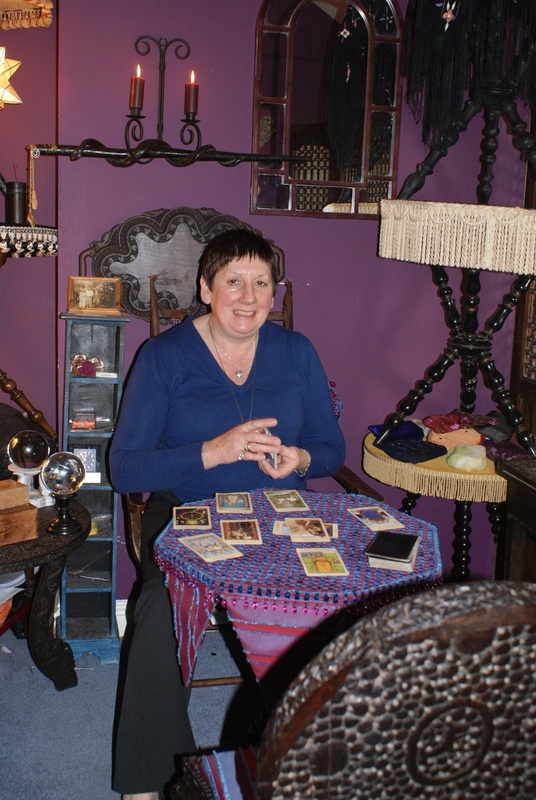 It is one of Sues pleasures to bring them back to their glory days, so that they can all be used in her Tarot courses, and her Crystal ball and Palmistry Workshops, as well as at fetes and fayres. The Reader is expected to sit in a special position with the one leg between her feet, and the two other legs emcompassing the client. Often the spacers below the table are set with an orb on top of a point , symbolising the world on its axis, and alluding to the knowledge which the table has access to. There are as many different style of table as there are makers of the table. Many were made by hand by the gypsy family who used them and were kept within the family, for generations. Through ages of use,old tables can have the feel of the readers through time , and this can either help, or hinder a reading, depending on the reader, and their abilities. I was recently given two very beautiful old tables, and I am now using them for my readings in Sanctuary. One is hexagonal with very deep silk twists falling from its top, the other is circular, covered in yellow velvet and has with it a very strong feeling of the older lady who used it previously.